They say this is the first car delivered in Texas. 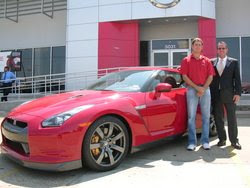 "...one Julio Nathal (who may or may not own an auto crushing business) was the first person in Texas to take delivery of the new 2008 Nissan GTR "Supercar," a car that boasts a 480-horsepower engine and, according to Wikipedia, can reach a top speed of 190 mph. The car most likely set him back a cool $70,000 or so, which I guess is good compared to Ferraris or Lamborghinis."